Why To Do Ghandruk Trek? Best views of Annapurna South and Fishtail Mountain. village inhabited by the Gurung community with own culture. The trek starts from Nayapul which serves as the gateway to the trek. It takes 2 hours on bus and 1 hour on taxi to reach Nayapul from Pokhara. The altitude of Nayapul is 1070 meters while that of Ghandruk is 2000 meters. 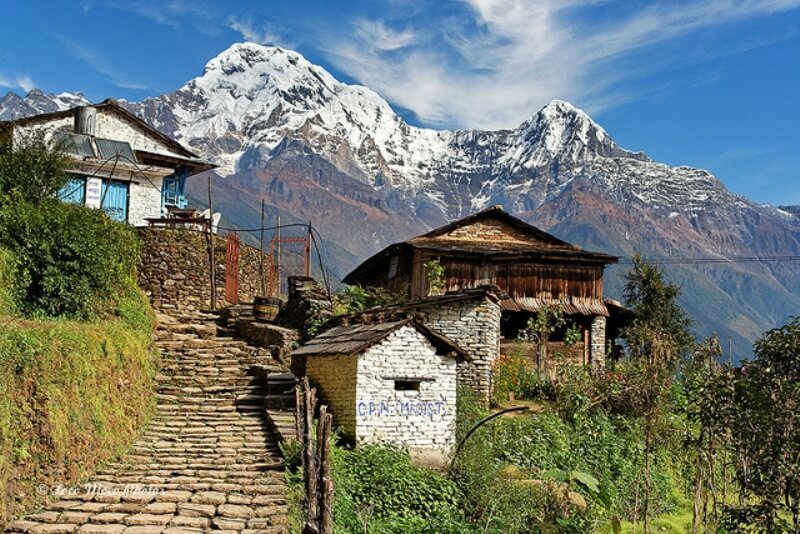 Ghandruk is the most scenic and popular trek that can be done from Pokhara. Ghandruk offers very close view of Annapurnas and the view during sunset and sunrise is fantastic. The walk provides you the breathtaking views of Annapurna South, Gangapurna, Annapurna III, Machhapuchre and Hiunchuli. The Mountain View is very beautiful and the trail is relatively easy. The highest point is only 2000 m. So there is no risk of altitude sickness. All of these make this trek an ideal choice for everyone looking for short trek in Annapurna foothills. Day 02: Ghandruk to Tolka (3:30 to 4 hrs). Day 03: Tolka to Australian camp (3:30 to 4 hrs). Contact us today for more tour information and pricing details.